Carroll Van Court and M. C. Merritt: George Freeth, 1915. Carroll Van Court and M. C. Merritt: He Sure Can Swim. 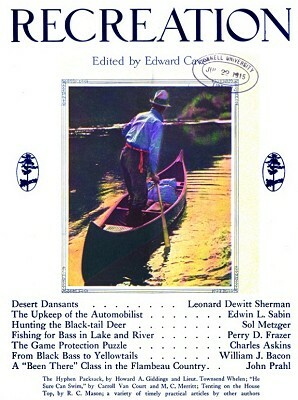 Outdoor World Publishing Company, New York. 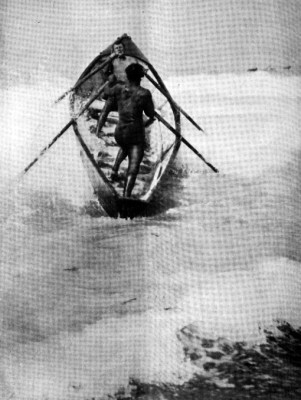 A article praising the swimming, surfing, diving and surf rescue skills of George Freeth. A large portion of the piece is devoted to Freeth's capture of a seal near Los Angles. Launching the Redondo Beach life-boat. So says everybody of George Freeth, the Southern California Coast's hero of the water. ON May 17, 1914, at Hermosa Beach, California, there were gathered about 3,000 people to witness the opening of a new pier. A program of music and athletics was given, including aquatic contests and exhibitions. There were swimming races, diving contests and aquatic stunts by amateurs and professionals. George Freeth, the swimming instructor of the Los Angeles Athletic Club, and one of the greatest professional swimmers and divers on the coast, was there and gave several exhibitions. He introduced surfboard riding at the California beaches. Freeth, who is one of the few men who have received special medals from Congress for bravery, his medal being presented to him for saving single-handed seven ﬁshermen from drowning, was entertaining the crowd with his stunts in the water, when a young seal came swimming by. Somewhere it had grabbed the bait of some ﬁsherman’s line and had broken the line. The large ﬁsh-hook still stuck in its jaw, with about ﬁve feet of strong line trailing from it, and the animal was evidently trying to dislodge the hook from his mouth when it came plunging by the crowd on the wharf. “Tag the seal, George,” someone cried. “Bet you can’t touch him." To the crowd’s surprise, Freeth immediately dove off the wharf and tore after the seal at full speed. He said afterward that he did not know who was the most surprised when he actually reached the animal, he or the seal. At any rate, the seal was so busy with the pestering hook that Freeth caught hold of the animal’s tail before it realized it was touched. Then came the explosion! Zing! The startled animal jumped into the air with a lunge and a splash, followed by Freeth, hanging on with grim determination. 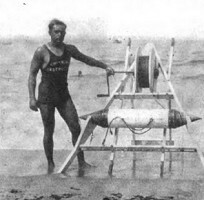 George Freeth and his life-saving torpedo. Down beneath the waves went the two, urged on by the delighted cheers of the surprised crowd of at least a thousand people. Seal and man disappeared for a few seconds. And so the battle continued, for nearly half an hour, the two appearing and disappearing at intervals. Finally, two boys in a boat rowed out to see the fun from a closer position. The seal, frightened to desperation, no doubt thought it saw in the rowboat a chance to escape. With an extra effort it made a pretty parabolic leap and landed fairly in the center of the boat.One boy fell out one end but the other was too late and the angry seal nipped a small piece out of his leg before he could get safely out of reach. Freeth's hands slipped off the seal‘s tail when his wrists struck the boat’s gunwale, but he jumped in and fell on the animal, grabbing it behind the head. After a terriﬁc ﬁght in which the seal bit Freeth on the arm and on two ﬁngers, the animal was subdued. Freeth was ﬂung a rope and, with the help of other swimmers succeeded in tying his captive. The seal is still in captivity, Freeth having disposed of it to a moving picture concern. Freeth once tried to untangle a live yellowtail from some kelp, and had a lively time for a few minutes, but he says the seal was a buzz-saw compared to that ﬁsh. He is one of the court’s ﬁnest fancy divers, and is supreme at water Polo. 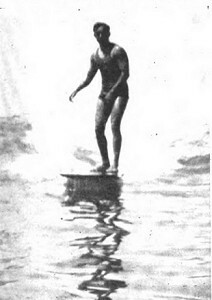 It was this same George Freeth who in 1900 restored the lost art of surf-board riding. In the museum of Honolulu is an old surf-board, handed down from the early days, which was given to Mr. Freeth by his uncle, a Hawaiian prince. As a boy he persisted in trying to ride the breakers standing on this board, which was sixteen feet long, two feet wide and four inches thick.After many mishaps he decided that the board was too long, so he developed the plan of his present board, which is eight feet long, two feet wide and three inches thick, made of redwood, weighing forty pounds. Freeth was born of English-Hawaiian parentage, in Honolulu, on November 8, 1883. His exploits in the water antedate his memory and they increased with rapidity and skill during the years. In life-saving work he detected serious defects in the ring buoy and invented one which surpasses it in efﬁciency and speed. His device consists of a hollow, air-tight copper torpedo forty-two inches by eight, which will hold up a dead weight of ﬁve hundred pounds. Being pointed, it will pass through the breakers with little resistance, which is impossible with the ring buoy. Wire is used instead of rope, thus largely overcoming the difﬁculty of being carried about by tide-rips or of being entangled in kelp. The device is held on a portable stretcher-shaped stand, easily carried by two, which holds the reel for the wire, and below rests the torpedo. Two, men operate on land and a third, with the cable fastened to his belt, carries the torpedo out. Freeth has rescued, with this life-buoy, four men in three and three-fourths minutes. But that is really nothing much to speak of, for during the eight years he has been on the Paciﬁc Coast he has rescued single-handed over two hundred people. In this box is found the pul-motor, bandages, blanket, etc. This motor-cycle is of great value when a call comes from a point on the beach a mile or so distant from the bath-house. Up to the present time Freeth has never failed whenever he has attempted a rescue. At the time he was not connected with any life-saving crew. Yet, going where no one else dared, regardless of danger from giant combers and rocks, he again and again plunged into the raging sea and brought to shore man after man until the seven were saved. In this hazardous way he spent two hours in the water. The men saved were mostly Japanese, and in recognition of what he had done the members of the local Japanese colony presented him with a gold watch and fob and $50 in gold; furthermore, the name of the ﬁshing village near Port Los Angeles, known as Maikura, the following year was changed to Freeth.